Hong Kong is a cosmopolitan city, featuring luxurious hotels and unsurpassed fine dining. We expected to find an overabundance of commercialization and skyscrapers, and not much more. While we certainly did find those things (is there really a need for a shopping mall at nearly every metro stop?) we were also pleased to discover Hong Kong and the rich, unique, and at times chaotic experience it offers to travelers. Vestiges of British control, traditional Chinese culture, and a large international presence mix together throughout the metropolis; the result is a strikingly unique culture that promises moments of pure delight. While at first the city might appear overwhelming and exhausting, take a moment to step back and enjoy the energy that is Hong Kong. Here are our travel tips to get you started. Unless you are travelling from China or Macau, you’ll probably be arriving in Hong Kong via air. Its importance as an international hub in Asia means most major and budget airlines have connections at the Hong Kong International Airport. Once you arrive, there is an Airport Express Line on the MTR (metro) that connects the airport to Central, Kowloon, and Tsing Yi. It is a bit pricy at HK $100 (one way) but extremely efficient. For budget travelers, there are numerous buses that will connect you to most major areas in and around Hong Kong. For a complete schedule and routes, see the City Bus webpage. Hong Kong has an extremely thorough public transportation system. It’s easy to use, and by far the best way for travelers to navigate the city. The MTR is comprised of seven lines that make stops at most major hubs, including the airport and Disneyland. They are extremely clean and prompt, and run until 1am. Note that you cannot eat or drink on the MTR-it’s a surefire way to pick out tourists! There are also numerous bus routes (see City Bus webpage listed above) that are slower, cheaper alternatives to the MTR. We used these on occasion, but definitely prefer the MTR. To cross the harbor, try one of Hong Kong’s ferries. The Star Ferry is the most popular and cheapest option, not to mention a great place for photographing the skyline and mingling with commuting locals. Be sure to get an Octopus Card! It’s valid on eight forms of public transportation—hence the name Octopus—and is by far the most convenient way to pay for the MTR and city buses, and even make purchases at convenience stores! To obtain an Octopus Card you must visit a ticket office or customer service station at an MTR stop and pay a refundable HK $50 plus HK $150 for travel. After that, simply scan your card on the touch-and-go systems to board public transport. You’ll even get a 5 to 10% discount! Recharge your card at convenience stores or customer service stations. Yes, it’s true. Accommodation in Hong Kong is likely to be one of your biggest expenses if you don’t plan ahead. The large population is all in search of space on such a small area of land and the rent is expensive for locals, as well as tourists. If you want to splurge, than rest assured: Hong Kong has the ritziest hotels to choose from. Popular options include The Upper House and Hotel Icon; however, for those who are in need of a more affordable hotel in Hong Kong for a few nights, then searching online can help you with booking a hotel that is in your budget. Also there are hostels and B&Bs all over town, but don’t expect much bang for your buck. You get what you pay for, and you’ll be hard-pressed to find options under $25.00 per person a day. We slept soundly and made wonderful friends by Couchsurfing during our stay in Hong Kong. We even awoke to homemade pancakes every morning! Expect to ask multiple people before someone can host you as most Couchsurfers in Hong Kong get many, many requests. The Hong Kong skyline immediately captivated us. It was a defining factor in our love for Hong Kong, and a large portion of our time in the city was spent chasing the perfect skyline photograph. It is perhaps best viewed when reflecting off Victoria Harbor, as day turns to dusk and buildings illuminate. Although a touristy area, a stroll down the Avenue of Stars in Tsim Sha Tsui is a must. Whether you have any interest in Asian celebrities is irrelevant; the promenade will take you past stunning views, the observation deck for the Symphony of Lights (the entire skyline lights up to the beats of the nightly featured song), and the Ferry Terminal. From here you can take the Star Ferry (mentioned above) for a mere HK $3. Operating since 1888, riding the Star Ferry also offers a distinctly historical and cultural experience as well as a unique perspective of both Hong Kong Island and Kowloon. If your budget permits, you might also consider a romantic evening cruise around Victoria Harbor. The Peak—the highest point on Hong Kong Island—is known for it’s magnificent panorama of Hong Kong, with China stretching off in the distance; however, you must be graced with a rare sunny day to truly enjoy its famous views. Take the iconic red tram to the top, but be prepared for the steep, stomach-jolting incline. Consider leaving time for one of the easy walking trails around the top of the mountain (we thoroughly enjoyed the relaxing 3.5K Peak Circle Walk) or one of the paved hikes down to the base. Besides the views and trails, you’ll also find shopping malls and restaurants. It’s not necessary to pay for the Sky Terrace as exceptional views are found on the Gallery rooftop for free. Tian Tan Buddha, or simply the Big Buddha, is one of the world’s largest Buddhas as well as a popular tourist attraction in Hong Kong. Serenely nestled on the hills of Lantau Island, it also takes a bit of a time commitment and varying amounts of dough (not to mention hundreds of stairs) to access the Buddha’s smiling face. We wrote an entire post dedicated to visiting the Buddha for more information. Although we didn’t have time to explore Lantau Island ourselves, we have heard extremely good things about it, particularly the Tai O fishing village. We sought refuge in the nunnery when a surprise thunderstorm released its anger on our umbrella-less selves. 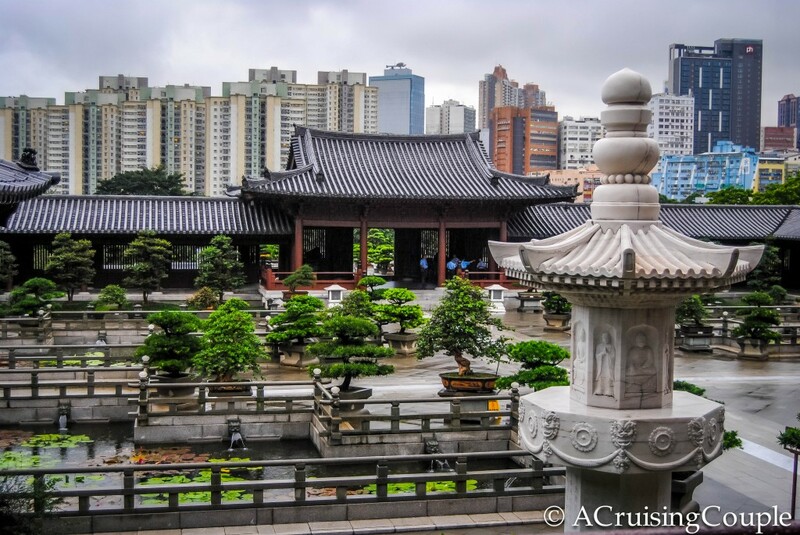 Even through the pelting rain, we could tell that the Nan Lian Gardens were beautiful and tranquil, a source of refuge in the middle of high-rise apartments. The nunnery is a Buddhist temple complex, again made all the more memorable from the juxtaposition of surrounding skyscrapers. The Chi Lin Nunnery and Nan Lian Gardens are free to enter, and definitely warrant a visit if you are in the Diamond Hill area. There is also a vegetarian restaurant at the nunnery that receives wonderful testimonials from the talented bloggers behind 20 Years Hence. Hong Kong is justifiably known as a haven for foodies. Cuisine ranges from inexpensive, authentic street food to Michelin Star, gourmet cuisine. Between our Couchsurfing hosts cooking up top-notch hot pot to our encounters with family-owned noodle shops, I’m pretty sure I left Hong Kong with a few souvenirs uninvitingly clinging to my hips. One of our favorite experiences in Hong Kong was with the amazing Cecilia and Silvana of Hong Kong Foodie Tours. They guided us through the Sham Shui Po district, an enclave for good eats and genuine Cantonese cuisine, with the perfect serving of history, architecture, and culture on the side. To learn the ins and outs of the food tour and the delicacies we encountered along the way, be sure to read our entire review. 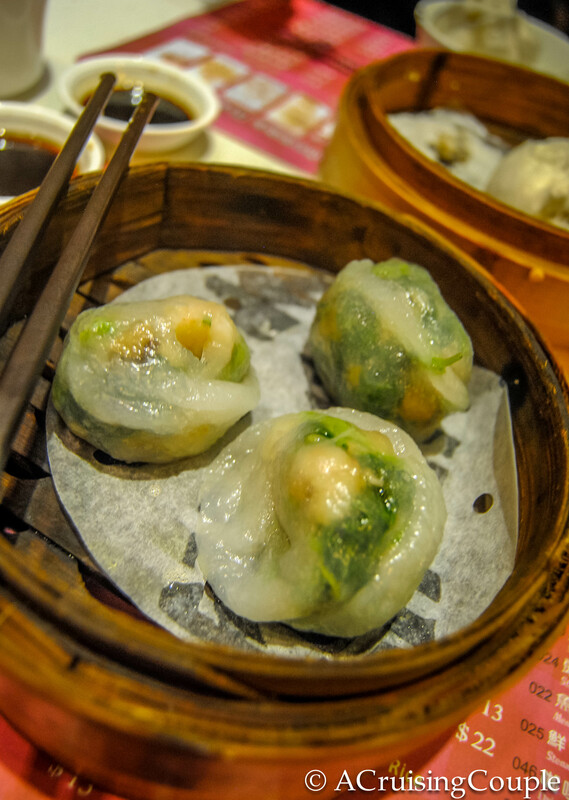 We highly recommend a stop at One Dim Sum, a Michelin Star restaurant serving dim sum all day long at affordable prices. Score! Don’t miss the steamed pork dumplings, fried dumplings with salted meat, steamed rice sheet rolls, sticky rice steamed in lotus leaf, and barbecued pork bun. Another extremely popular Michelin Star dim sum restaurant is Tim Ho Wan, although we decided against dining there after hearing of the ridiculously long and inconvenient waiting times. SOHO is Hong Kong’s chic entertainment district, where expats go to see and be seen. Located in Central, this upscale area of Hong Kong is where you’ll find the most exclusive bars, exotic restaurants, and romantic alleyways. Although SOHO is a well-groomed area on the surface, there is more than just modernity and alcohol consumption in the district. Don’t miss a stop at Tsim Chai Kee, a noodle shop famous for its wontons and fish balls. We also thoroughly enjoyed splurging at Staunton’s, a wine bar on the corner of (you guessed it) Staunton Street. Simple bar foods are served, but it’s the wine list that steals the show, with over 30 varieties available by the glass. It’s also been voted as one of the best places in Hong Kong to people watch, just in case you need some entertainment with that vino. If you are looking for inexpensive knock-offs of Mulberry and Chanel, this is the place for you. You’ll see the same products again and again at the stalls lining the outdoor market, with handbags and clothing dominating the line. Be aware that all the prices are inflated and of poor quality; you’re expected to haggle and often the best prices are shouted out as you walk away. 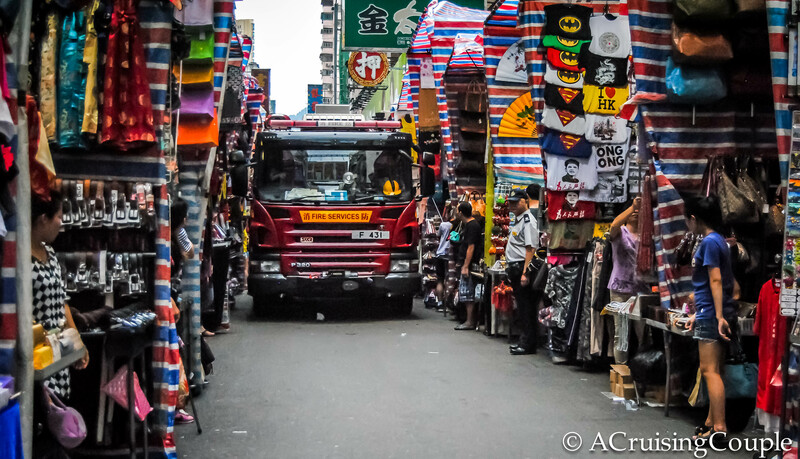 An iconic night market in the bustling Kowloon district, the Temple Street Market is the place to sample local street foods and pick up any electronics or clothing items you couldn’t find at the Ladies’ Market. Be sure to head here after dark when the real excitement begins. 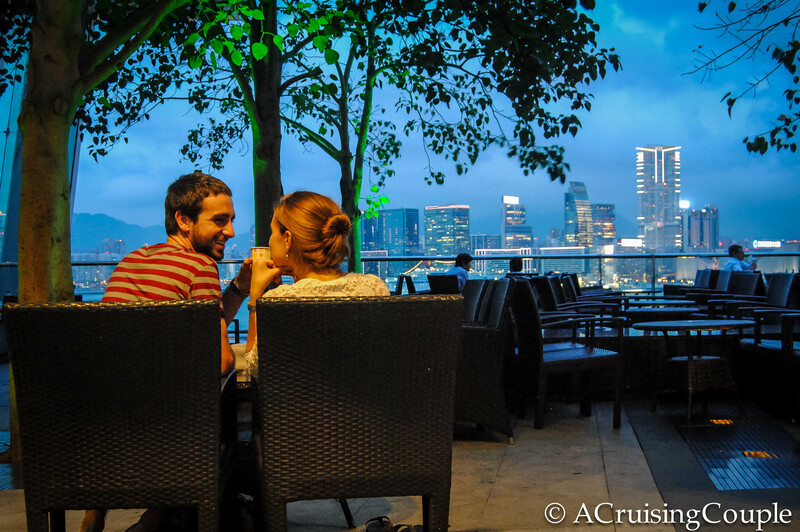 It’s hard to beat scrumptious wine and cheese, especially when you have the Hong Kong skyline all to yourself. Relaxing while admittedly murmuring a few sweet nothings on the outdoor patio of the IFC was without a doubt one of the most romantic (and wallet-friendly) things we did. Again, can we take a look at that skyline?! Budgeting for Hong Kong is entirely dependent upon you. We spent an average of around $25 a person, per day, but that was only possible because we Couchsurfed. One can easily spend 10x that amount without even trying. Keep in mind that accommodation will probably be your largest expense. Another surefire way to watch your money disappear is by frequenting Hong Kong’s fashionable bars and numerous classy restaurants. 1. Couchsurf. Okay, we’ve probably beaten this nail on the head a few too many times, but if you’ve never given it a go, perhaps this will convince you to try! 2. Certain districts are more expensive than others. Remember that your money will stretch much farther outside of the touristy, expat-dominated districts. Stick to where the majority of locals live and work for the best, and often tastiest, deals. 3. Buy beer from the 7-11. If you just want a drink to unwind or relax with friends after a long day of sightseeing, save valuable moolah by purchasing your alcohol from the numerous 7-11s. Nothing beats donning your glitziest outfit for a night out on the town, but save it for special occasions. There are no open container laws in Hong Kong, but don’t abuse the privilege. 4. Enjoy all the free things in Hong Kong! Most of the attractions listed above are free or only cost a small fee. Strolling through the SOHO district with our new Cantonese and French friends we met via—you guessed it—couch surfing. We didn’t actually stay with them, only meeting up for an evening of dinner and drinks. However, we learned so much about Hong Kong in that brief time, sharing bellyaching laughs and life-changing travel stories, all the while learning about the vibrant city of Hong Kong from the lenses of locals. Don’t miss our Hong Kong page for more detailed travel articles and tips for visiting Hong Kong. Want to see more pictures? 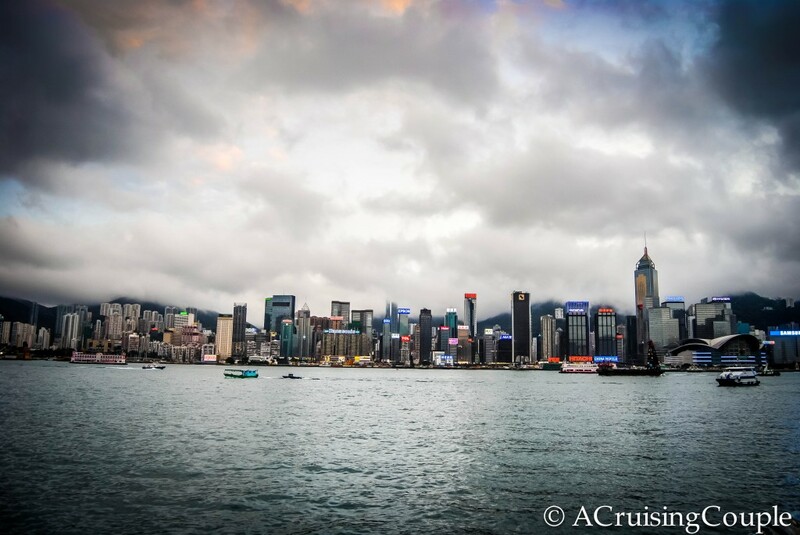 Photos of Hong Kong abound on our facebook page. Be sure to check them out and like our page while you are there! We really enjoyed the grounds of the Chi Lin Nunnery. It’s such a peaceful contrast to the surrounding chaotic city. Thanks again for the suggestion! It’s definitely a must. Thanks so much for linking to my Tai O article! This is a really great guide to the city – I’d so love to go back and do the things I missed! The food in Hong Kong really is phenomenal, especially – as you say – in the less touristy areas. I recall finding a little restaurant under all the flyovers in Mongkok which sold the most amazing fish ball soup for about 15HKD. Ridiculously good! Ironically the only food let-down was at the Jumbo Kingdom Floating Restaurant. We were amazed at the variety of delicious food. Best of all it’s cheap! We heard lots of stories that some of the more famous restaurants started slacking once they “made it big.” There’s nothing like finding those hidden gems for yourself. We could have spent a whole week there trying out all the dim sum on offer. Super yummy. What did you think of the Big Buddha? Nice tips guys! I’m heading there in a couple of months – can’t wait to finally visit Hong Kong. Awesome! I’m sure you’ll love it. Let us know if any of these tips come in handy. Can’t wait to hear about your experience! Great tips here! We have spent about a total of 2 weeks in Hong Kong over our travels in Asia and love that city/country! But you’re right, it can be very expensive. The rooms there are so overpriced and the value for money is awful (well, for the hostels anyways). CouchSurfing is a better idea. Thanks so much for the kind words! When we were doing research we were overwhelmed by the prices of rooms. CouchSurfing really is one of the best ways to get to know a city/country! We wish we would have done it more here in Taiwan. Hey Casey! Curious to know where you stayed. Did you stay at a few different places via couch surfing? We traveled to Hong Kong about a year ago… mainly for business meetings. Wish we had stayed for longer. The food was amaaaaazing! Glad to find out about Cecilia and Silvana’s Foodie Tour from your post. May try that next time when we go again! Thanks Mzuri! The food really is so good and I definitely recommend the foodie tour if you go back!! :) We actually couch surfed at one place the whole time. It was an awesome way to experience the city! I am leaving for Hong Kong on Sunday and have yet to find anything as good as this post!! Thank you so much for all the time and work it must have been, it’s so helpful! I definitely recommend Kau Kee noodles on Gough Street in Sheung Wan. It’s amazing and less than $1 for a bowl of the best beef brisket noodles you’ll ever have. Perfect for budget travelers. There’s usually a line but it moves swiftly. I also recommend Ka Ho in Central for dim sum. My local friend is a chef and he took a group of us there to eat and he recommended it to readers in an Epicurious interview as well!! So much good eating to be done in HK from budget to luxury!! It’s one of my favorite food adventure cities.